Attempts at wholesale cultural change are costly, disruptive and unlikely to succeed. This is because culture rests upon long held ideas, customs, habits and attitudes, which have become the largely unexamined ‘way we do things around here’. 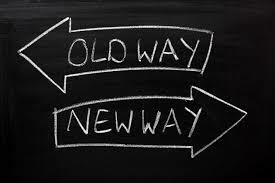 A more fruitful approach is to identify and reinforce those behaviours that are congruent with your change programme and change those behaviours that will obstruct it. And the key to behaviour change is ‘show don’t tell’. Just as it is extremely difficult to argue someone out of a deeply held belief, you will struggle to force people to change the way they think and feel about work. Experience, seeing the behaviour being effective in action, is a better teacher than logical argument. In other words, behaviour change is most effective when it is supported by both empirical evidence and observation of better results. Take for example the London tube strike of February 2014, which caused 75% of commuters to change their routes. The surprising thing was that once the strike stopped 5% of commuters continued to use the new routes (tracked through oyster card use). It seems that prior to the strike some Londoners had unwittingly taken suboptimal routes to work and continued to use them through habit. The reasons for poor initial route planning are unclear, but may include the fact that the tube map is misleading (it can be quicker to walk between some tube stations) and that tube lines run at different speeds. Whatever the reason, the key point is that commuters changed their behaviour as a result of experience. Identify and focus on those few critical behaviours that are obstructing change. Identify what factors contribute to those behaviours. Determine how you can counter or mitigate those factors. For example, you may want your staff to cope better with change and seize the opportunities it presents. You discover that the behaviours working against you are that senior management don’t communicate clearly and staff don’t reflect on their practice. The factors you identify supporting senior management behaviour are that channels of communication are poor, communication is infrequent and any communication that does happen is detrimental in style and tone. In the case of staff behaviour, they don’t have the time to reflect, they are not exposed to new ideas and they have no sense of what the organisation is trying to achieve. Self-efficacy, whether the individual thinks they can do the behaviour (have the skill or ability) and whether it is worth it (what is the reward). With these points in mind, develop and reinforce new behaviours with training, metrics, incentives and rewards that lead people to practice them, because they believe they will work and can see the value. Enlist role models (change champions in the jargon) and model the behaviours yourself to demonstrate that other people are doing the new behaviours. Monitor and measure the results, in order to communicate the positive effects, so that staff can see that the changes are worth it. Ultimately, like London commuters, your staff will change if they experience a better way of doing things.